Topics: Australia, Government, Unemployment, Rate, Work Permit, and Council. The estimated 91 daily visitors, each view 1.10 pages on average. It is hosted by Hostdime.com Inc (Florida, Orlando,) using Apache/2 web server. 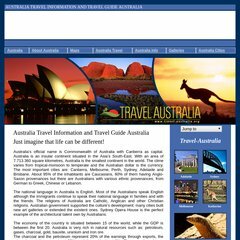 Travel-australia.org's server IP number is 66.7.210.190. It has 2 DNS records, ns1.hosting-mauritius.com, and ns2.hosting-mauritius.com. PING (66.7.210.190) 56(84) bytes of data. Website load time is 12102 milliseconds, less than 99% of other measured websites. As well, a ping to the server is timed at 120 ms.